Click above to visit Metro’s Budget tool. Spring is in the air, meaning it is also Metro’s annual budget season 🌞🌻📊. The budget for fiscal year 2018-19 has been released and is posted above. The budget covers the fiscal year that runs from July 1, 2018 through June 30, 2019. The Metro Board of Directors will consider the budget during its May round of meetings. •Overall the proposed budget is $6.6 Billion representing a modest 4.5 percent increase over the current fiscal year’s budget. •Bus Service is projected to increase by 1.5 percent from the current fiscal year’s service levels, primarily due to Metro’s “New Blue” rehabilitation program — in which bus service will replace Blue Line service during the closures that begin in early 2019. •Rail Service Revenue Vehicle Hours are increasing very slightly, with more Gold Line vehicles in use during peak hours and every-six-minute service on the Green Line during the morning peak hours. •The budget will continue to supply dollars for the ongoing construction of several transit projects — including the Crenshaw/LAX Line, the Regional Connector and the Purple Line Extension, the three projects that are currently using the bulk of the construction dollars. We want to hear from you. Public comments can be submitted or emailed before Friday, May 11 at 5 p.m. to budgetcomments@metro.net or mailed to Metro at One Gateway Plaza, 99-24-1, Los Angeles, CA 90012, attention: FY19 Budget. Wednesday, May 16 at 12 p.m. Here is last year’s $6.1-billion budget. 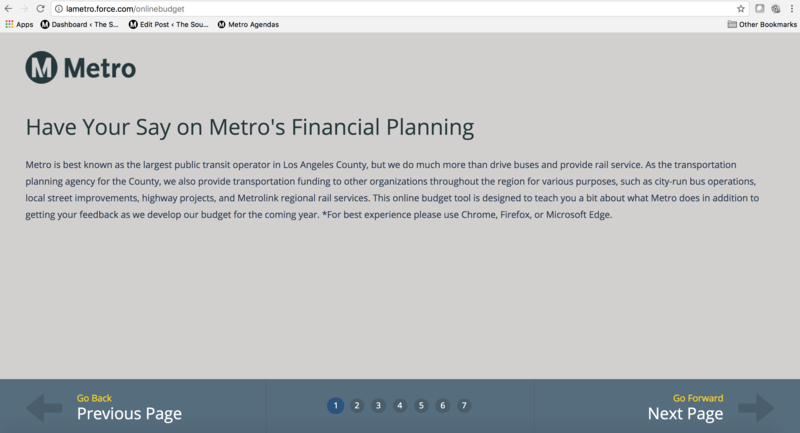 And here is the main budget page on metro.net, with more information about the agency’s budget process. “Bus Service is projected to increase by 1.5 percent” , which is less than the current and projected rate of inflation. Way to go supporting the bus riders!!!!! We still haven’t heard Metro’s logic on why the Blue Line work has to be done prior to the Crenshaw Line opening.